I’ve always loved those fancy Japanese pompoms on Pinterest, the ones that have flower or polka dot patterns on them – they would make lovely handmade gifts for kids! The links always seem to end up at Japanese sites that look like stores and I couldn’t find a tutorial anywhere. I decided to give it a go because once I’d figured out how it works, I’d be able to make pompom flowers, animals, planets … anything out of pompoms! I started by devising a pompom maker out of cardboard. I didn’t really want to buy another plastic thingy I may not use that much and I wanted to see how these would turn out first. 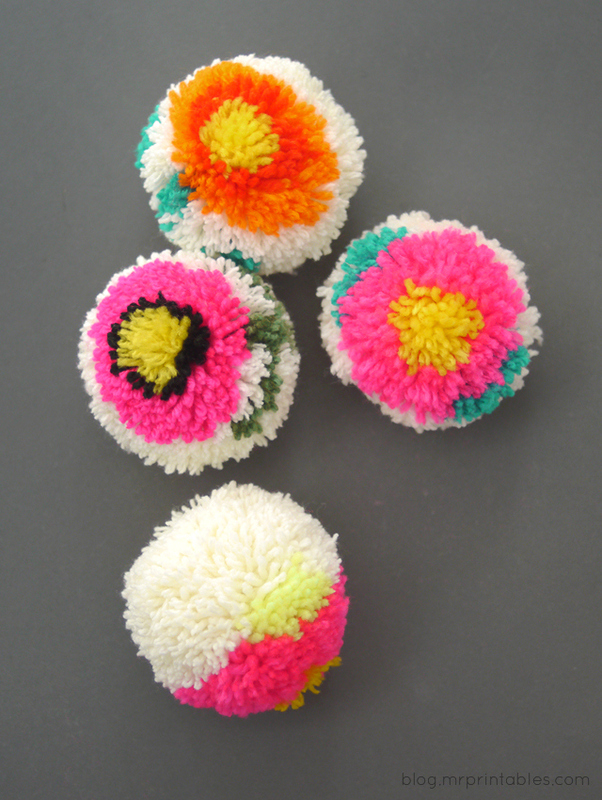 I know pompoms look lovely but they may be boring to make or way too time-consuming to be worth it. Well, after I tried one, I got immediately addicted and made three more straight away in no time! I was very happy with my cardboard pompom maker, they worked so well and are perfectly reusable so I think I’ll stick with them for a while. 1. Firstly, determine what size of pompom you want to make. The final pompoms seem to be about 10% larger than the diameter of the pompom maker. My cardboard pompom maker was about 2.5 inch diameter for the outer circle and 1 inch for the inner circle. The final pompoms were quite a large handful in size. So, according to the size you decide, cut 4 half circles with a hole (inner circle) in the middle with extended ends (let’s call them tabs). Make fold lines at each end of the half circle by pressing a ruler across so you can fold those tabs later. Cut smaller half circles and glue them on to the large ones (like the ones on the right in the pic). This is to create some space along the edge between the cardboard pieces when they are put together so you can insert the scissors between them easily. 2. The one with the inner part (right in the pic) and one without (left in the pic) make a pair. Put two together facing each other so the small glued-on inner part is between the larger outer arcs. 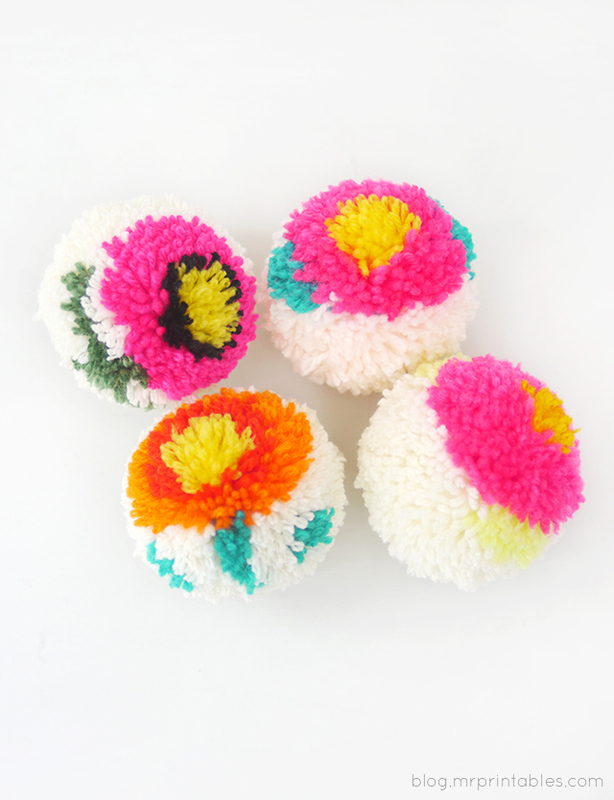 Each pair makes one half of your pompom maker. 3. Now draw your pompom design roughly on paper and draw a line down the middle (dotted line in the diagram below). If you imagine that this line is your pompom maker viewed from the top, you can see how the yarn should be layered based on your drawing. Starting with whatever is directly in the middle touching this center line, add yarns accordingly in layers towards the outer circle edge. I did this in reverse at first, starting with the background color and finishing with the colors in the middle. It sort of worked but the result was a little bit messy. Then I figured out starting it from the middle like below, working outwards, which is a lot easier. Got it? 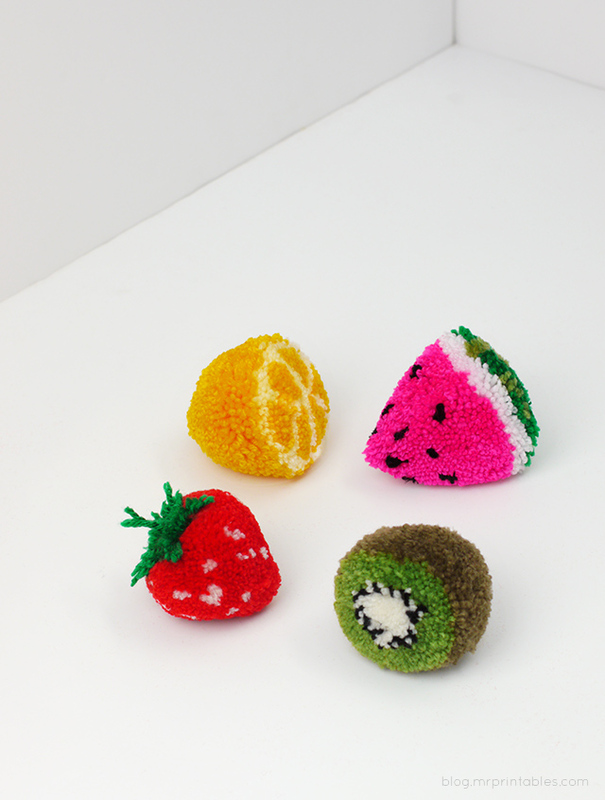 Now you can make anything into pompoms! I’m going to try next some animal faces, polka dots, stripes, little globes…. Fun! 5. Now fold all tabs outward and bring the two parts together to form a whole circle. Clip the tabs together with binder clips as in the photo below. 6. Insert scissors into the gap between the cardboard pieces and cut the yarn. As you do, the hidden pattern will be revealed like a blossoming flower which is an exciting part! 7. Insert a yarn between the cardboard pieces, running it all the way around. Pull and tie tightly. 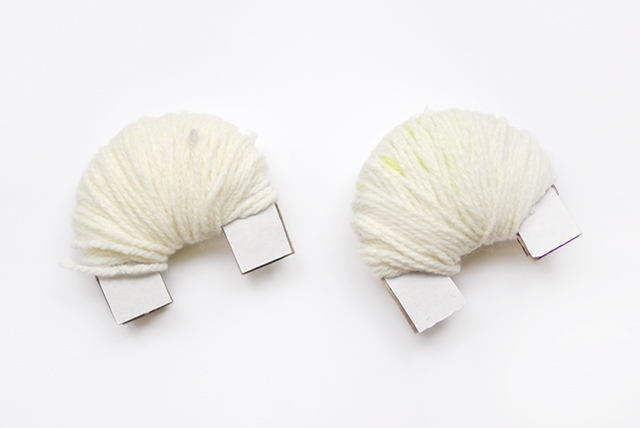 Choose a good position for tying it up as you’ll use that piece of yarn to hang your pompom. Now you can unclip the clips and pull out the cardboard pieces. Done! 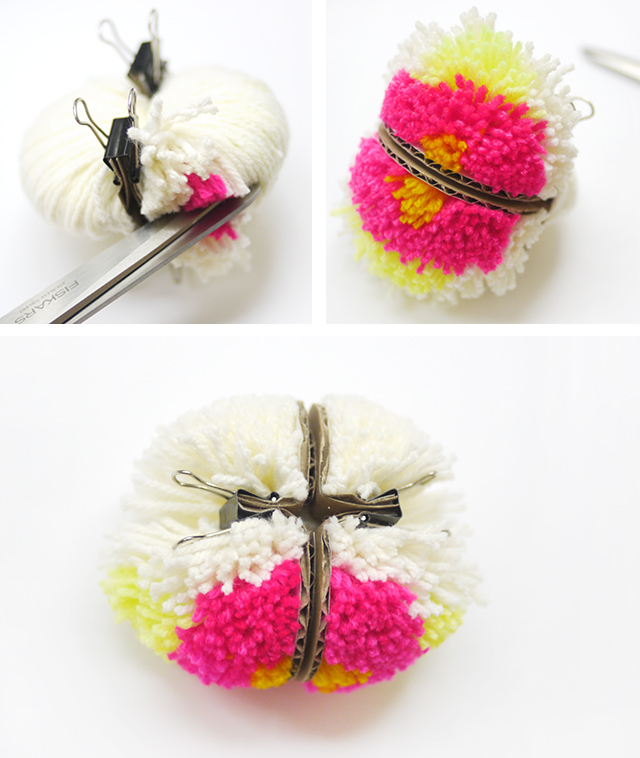 The pompom will not be perfectly round so you’ll need to give it a bit of a trim to form a good shape. I might use one to add to a gift wrap, or use it as a gift as it is. 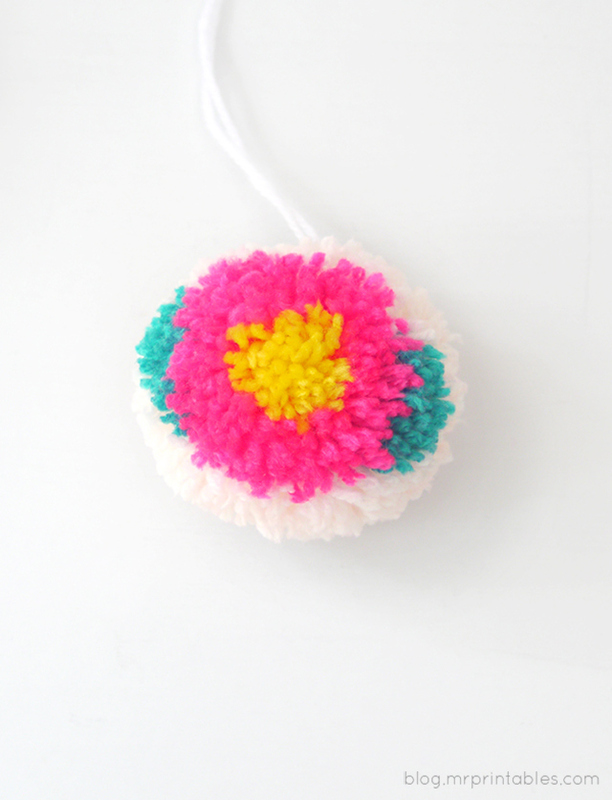 Hang it to a kid’s bag as an accessary or make a flower pompom necklace. Tease a cat or wear in your hair. Or just admire them on your desk or hanging about the house. They cheer you up. Hope you have a go at it! Wow, found this on pinterest just now! Fantastic idea! Wow! I love them, Olive! How fun! I just have a question about the flower with the stem and leaves. Does the flower go on one half of the pom pom maker and the stem goes on the other half? I wasn’t quite sure. Please let me know. Thank so you so much for this DIY! Thanks Melissa! I made the flower and stem all on one half of the pompom maker (making it all white for the other half.) You make the flower part on one side of the arc (off center) and wrap a thin layer of green for the stem at the other end. 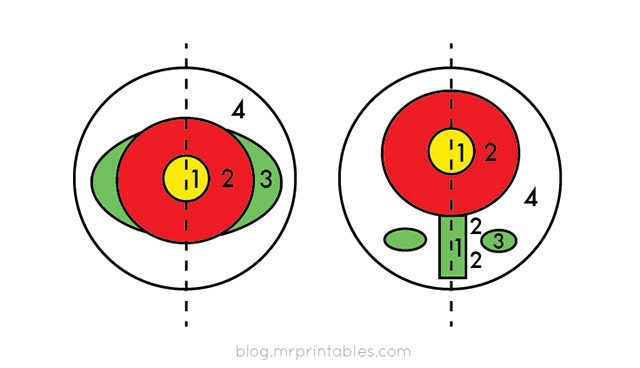 If you see the diagram on the right, you start with all the colors that meet the dotted line. Does it make sense? ^^ Once you make one, you’ll get the hang of how it works. Have fun! Thank you, Olive. I can’t wait to try it. Yes, I get it now. Oh I love these. They’re going on my must make list. I might try making a polka dot one first though before working my way up to the flower! I was so tempted to do the polka dot first. Can’t wait to try. Have fun with yours! oh my wow! thank you! I saw some picture poms and have been wrapping my hands silly attempting my own. I would never have thought to change the shape of what we were wrapping. instant fave…LOVE! 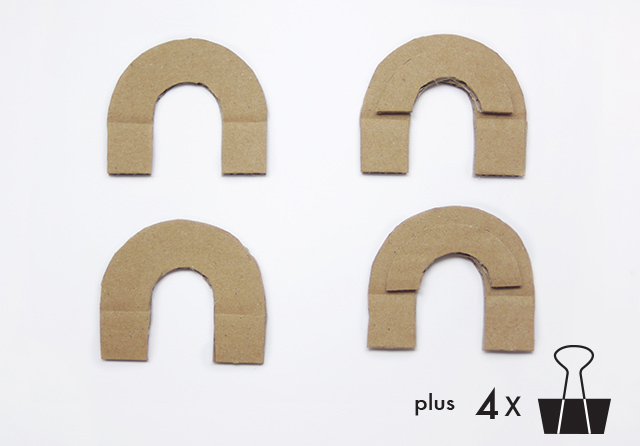 This cardboard shape works very well – enjoy! These are great! 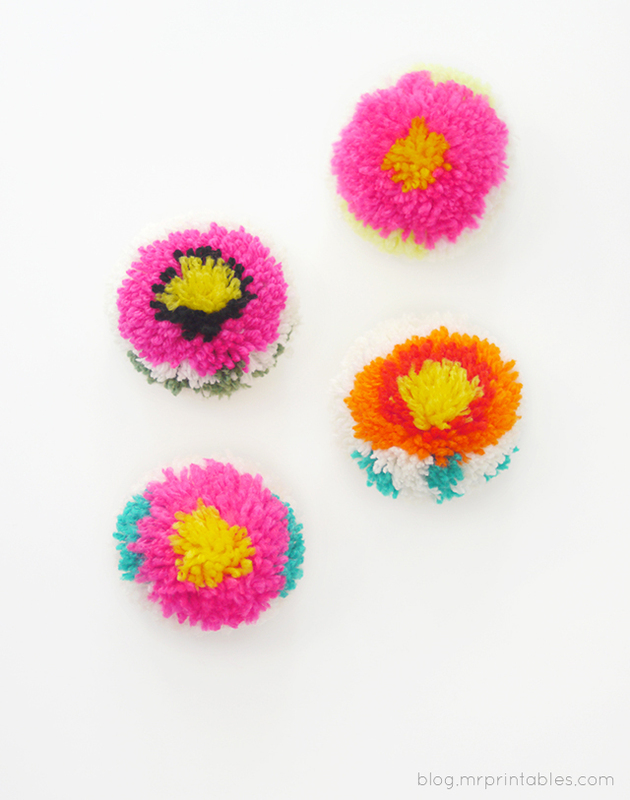 I want to make a whole pom-pom garland out of these fancy flower pom-poms. So… I just attempted this and came no where near your pom pom perfection. Is it possible to just purchase some from you??? This is genius! I can’t wait to make myself a bunch of these! =) Thank you! Hope you have lots of fun with it. Thanks! I’m confused with the last part. How do you get the thread between the cardbord pieces to tie around. They are stuck together??? I super duper love this idea!!!!! Thank you so much for explaining the steps so clearly. So excited to try this. Hi, I love this! Can you please explain how you got the floating green leaves? They aren’t explained or in the photos. Thanks! Hi how can I gwt to download these instructions please? Hi Lyn, there isn’t a downloadable instruction. You’ll need to follow the tutorial on this page. Sorry! Hi Lyn, sorry for the late reply. There is no downloadable instruction, but you can copy and paste the parts you need from this page and print them I think! Oh, wow! I’m not sure I’m ready to tackle flowers with leaves, yet, so I may try some concentric rings. But, my favorite part is your directions for making the 2-part pomp-pom maker! I really like the way that the half circles make wrapping a breeze, but really wasn’t into buying a bunch of the plastic ones. I have plenty of cardboard on hand, so now I can have a whole set for free! Thanks a bunch! Oh, and I found the link to your blog via the Poppytalk blog! Oh, my! I think I’d better stick with the flowers for now. Although, it would be fun to make a few frog pom-poms once I have flowers mastered 🙂 Thanks again! WOW! I don’t think I’ve ever seen this before!! Too cool. Cooler than PB&J (even honey PB with raspberry preserves- my personal fave). You are a genius. I just made cute little panda and it turned out pretty good, but I have a little problem. When I’m tieing it all together you say ‘Insert a yarn between the cardboard pieces’. How exactly do I do that if I glued smaller half circles inside two bigger circles to make a pompom maker? I managed to work something out with my panda but it’s not tight enough so when ‘combing’ through I had to be extremely careful not to pull all the yarn out..
Ohhhhhhh never mind… I shouldn’t have glued both bigger half circles to the smaller one.. Oops. Thank you for this tutorial. I actually tried a Pom Pom with a letter in the middle and it came out great. Olá , sou do Brasil e gostaria de fazer pom-pom com o formato do mickey para a festa dos meus filhos, você pode me ajudar ?? Tenho um blog, posso divulgar seu trabalho lá ? I wish you had a video to go along with this. It would help me greatly. Incredible idea I just can’t seem to get the flowers to come out just right. Your results however are adorable! WOW!! your works are great!! *_* Do you think it would be the same if I made 2 circles instead of 4 parts? Thanks Alice. 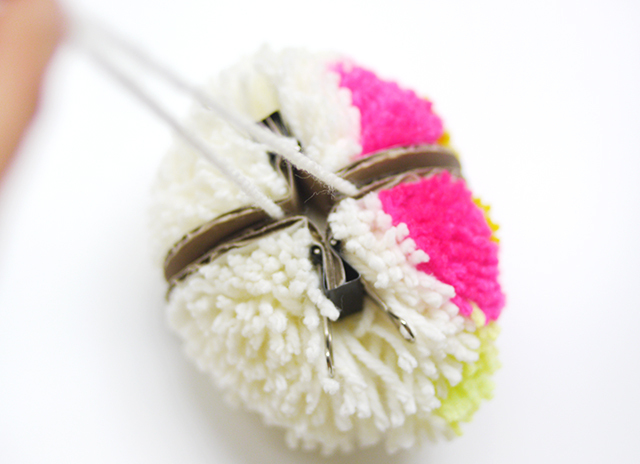 ^ ^ You’d need to make 4 parts pompom maker to be able to split it in the middle so you can tie up. ( if this is what you mean) Hope it makes sense! I’d love to do videos but I need to learn to take better photos first ^ ^ One day! muy lindos pone como se hacen los animalitos , estan muy buenos…..
Hi there, I love your pom poms. They are just too adorable. But I cant understand the part where you say to bring the tabs outward to meet, wouldnt the yarn prevent the tabs from meeting? Can I use the pompom maker from clover instead? I love your pom poms they are amazing. I have been making some ghost and panda ones and even a lion. Have you got any christmas ideas for pom poms, I have tried making white ones to hang on the tree and might even try some glitter wool or dipping the ends in glitter, it is so addictive. Thank you. Do we glue the large arcs of each pair together? Hi Celine, you don’t glue them but just place together and wrap your yarn around. Then use the clips to hold them when you cut the yarn. 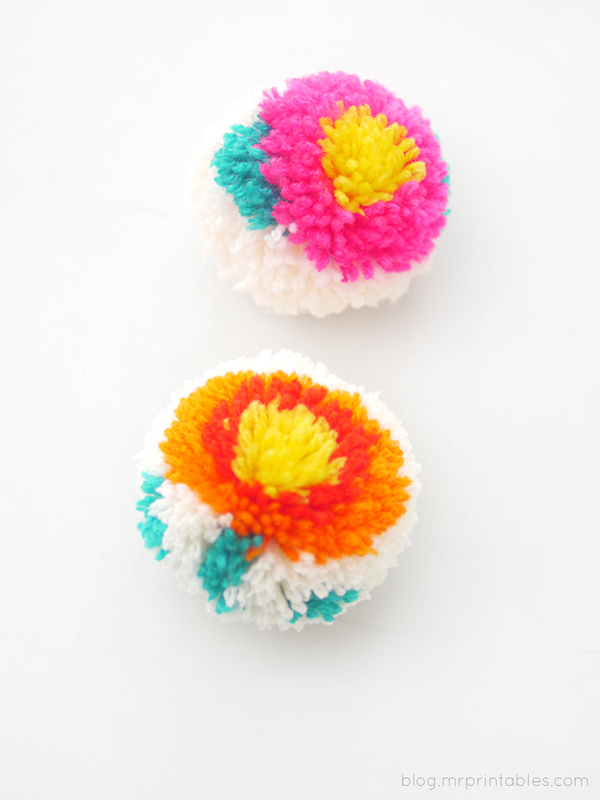 Please check out the flower pompom post for the details! Have you done a video yet? I have to see things being done literally before I know I’ve caught on the right way.. These are great! 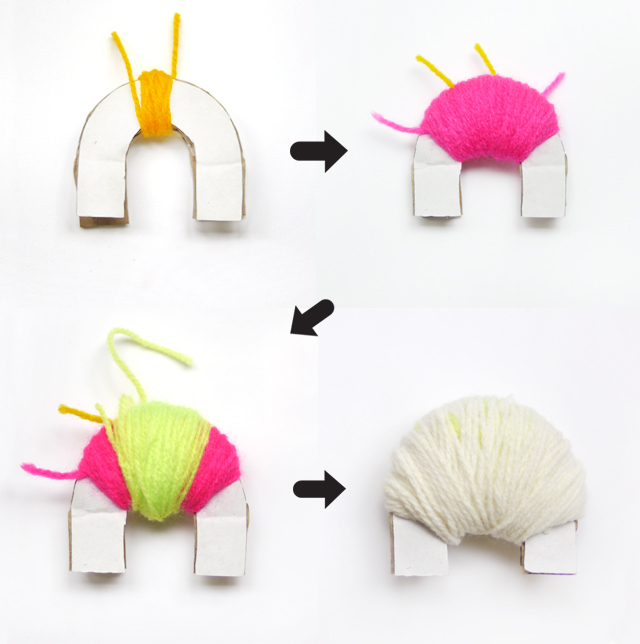 It is possible to make pompoms with 2 identical ring doughnut shapes of cardboard – we used to do it when we were kids. Cut two circles of cardboard the same size and then cut an inner circle out of each (same size on each one). Hold the two doughtnut shapes together and wrap round them – you have to have a small enough ball of wool to fit through the hole in the middle. Once you have finished all your wrapping, cut round the edge and tie between the two doughnuts as you do in your tutorial. You then have to ease the pompom out through the central hole on one side – this is usually ok as long as the pompom isn’t too densely wrapped. Alternatively you can cut the template away, but then you’d have to make a new one. Having said all that, I think your template is far better as it is easier to get off at the end and you can use a normal sized ball of wool when wrapping. I thought you might be interested to know it is possible with a whole circle though. ;( Still dont get it…….can u make a video??? Thank you very much, but I am a fan of the movie, Mirabella (Filipino movie) and there’s a magical flower there called Chrysanthemum (yellow with inner green) check out her flower, she wears it on her wrist or her ears to keep her beauty can I make those out of pom poms? please answer!!!!!!!!!!!! Can’t see the images, can you fix please? Hi! I originally saw your super adorable animal pompoms, and thought it’d be awesome to make a koala head for an Australian event. I came here to find how you make your pompom maker, but unfortunately the first three photos (the most confusing bit!) aren’t showing up. I know it’s been a while since you posted this, but is there any chance you still have the pictures elsewhere? Thank you! Thanks for sharing this! 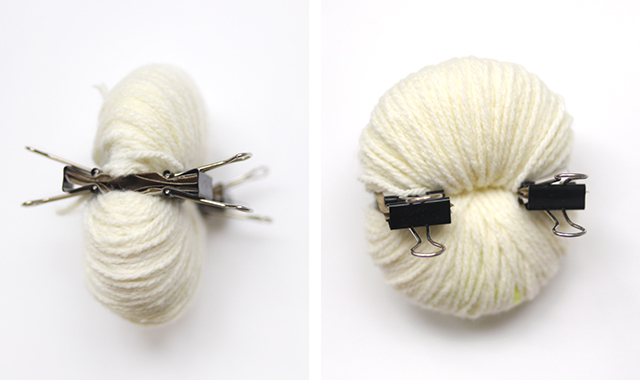 This is super useful and a great way to get rid of my extra yarn! Do you have an idea how I could make it??!! Have you got any baseball ideas for pompoms? I really loved this little project and I’d like to write about it on my blog. Do you mind if I use one of your photos, along with the photos of the pom poms I made? I’ll link it back to this post. I love your pom poms! 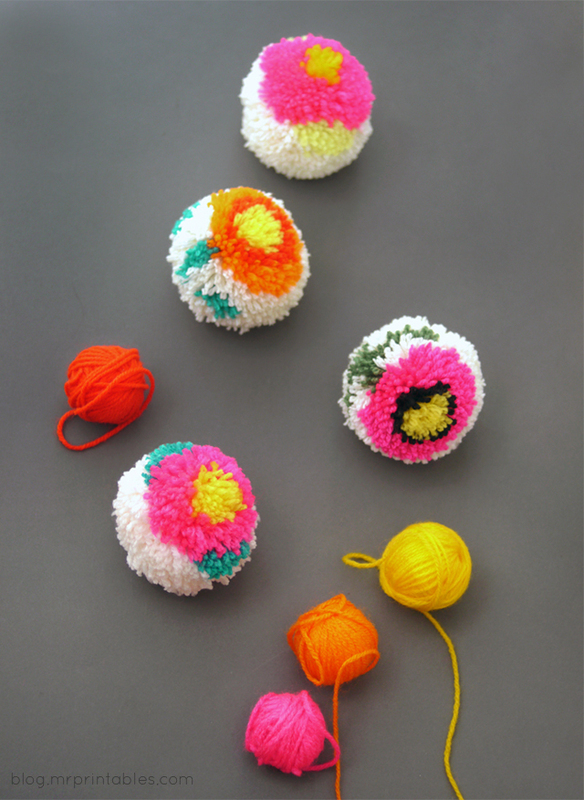 I’ve been looking all over to find a tutorial on how to make a design with pom poms. I’m glad I finally found your blog. I’m having some trouble making polka dots though. Could you give me some advice or even better do a tiny tutorial? Hi, I got here from the fruit pom poms, but i’m unable to see the pictures on this post and don’t understand the basic technique… can you re-upload the pics? Thanks! 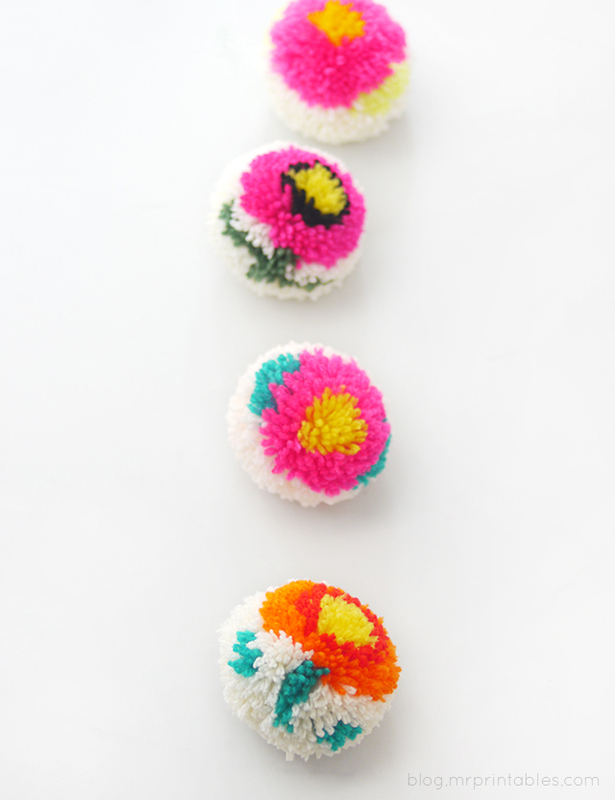 I am unable to get the pictures to show up on this pompom flower tutorial. Can you help, please?